Renowned energy expert Michael T. Klare provides an invaluable account of the new and increasingly dangerous competition for the world's dwindling natural resources. Arguing that the world is facing an unprecedented crisis of resource depletion -- one that goes beyond "peak oil" to encompass shortages of coal and uranium, copper and lithium, water, and arable land -- Klare shows how the desperate hunt for raw materials is forcing governments and corporations to stake their claim in ever more dangerous and remote areas that present grave political and environmental risks. Citing mounting tensions between the U.S. and China over control of resources in the Asia-Pacific region, volatile local border disputes that raise the likelihood of military confrontation, and the destructive environmental consequences of tar sands oil extraction and fracking, Klare argues that we need to radically alter our consumption patterns and build alternative energy systems before it's too late. Michael T. Klare is a defense correspondent for The Nation and the author of Resource Wars, Blood and Oil: The Dangers and Consequences of America's Growing Petroleum Dependency, and Rising Powers, Shrinking Planet: The New Geopolitics of Energy. He is a Five Colleges professor of Peace and World Security Studies, teaching at Hampshire, Amherst, Smith and Mount Holyoke and the University of Massachusetts, Amherst. Klare also serves on the boards of directors of Human Rights Watch and the Arms Control Association. "Michael Klare is one of the smartest guys around -- ahead of the curve, careful, and brilliant." 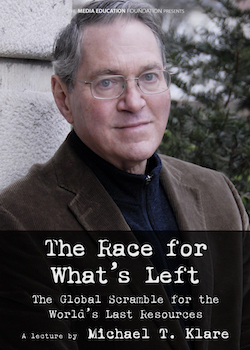 "The Race for What's Left offers a clear and troubling overview of the 'scramble' for the earth's dwindling resources. Offering insights into the social, political, economic, and environmental consequences of resource extraction in its current form, this video is an excellent primer for educators, students, and indeed all people concerned with the future of the planet. With riveting clarity, Klare outlines how resource use, especially of fossil fuels, is leading us down an increasingly destructive path, and why the turn toward alternative energy and a different kind of future demands immediate, and perhaps radical, action." "Michael Klare with this customary clarity of expression takes us through a whistle-stop tour of energy (in)security. His conclusion is sensible and sobering." "If the era of easy oil is over, what comes next? In this film, noted scholar Michael Klare presents a powerful case against business as usual and for a rapid transition to renewable energies and more sustainable lifestyles. Packed with information about the dire consequences of extractive industries and resource competition, the film is appropriate for multiple audiences, from the classroom to the community hall to the corridors of power."